International fight week has finally graced us, as we have back to back days of events. First up, the Ultimate Fighter 27 Finale. In what could be the final Ultimate Fighter, this card potentially symbolizes the end of an era. One in which has graced us with many UFC staples and Champions. Headlining the event is a pair of Middleweight risers in Brad Tavares and Isreal Adesanya. Tavares, comes into this fight on the heels of four straight victories. With sixteen fights in the UFC, the Hawaiian has finally earned some respect, as he headlines his first UFC event. On the other hand, Adesanya gets his first headlining act in only his third UFC fight. With two UFC wins, the last coming via split decision, it’s clear the UFC is pushing Adesanya. With his fan friendly style and personality, it’s hard to argue not too. 185 lbs. : Brad Tavares vs. Israel Adesanya – This is a fun fight and a very difficult one for the young buck Adesanya. Tavares is very capable striker and grappler. He has the ability to dictate where this fight goes and there is almost no chance he gets taken down with his top notch takedown defense. However, his chin has shown glimpses of being a potential problem. Against a technical and precise striker like Adesanya, over five rounds I see issues with Tavares being able to keep up on the feet. If Tavares wants to win this fight, he’s got to grind out Adesanya. A grapple heavy attack, one in which he has frequently used against opponents must be implemented here. However, like I said, his chin will be a problem in this fight. 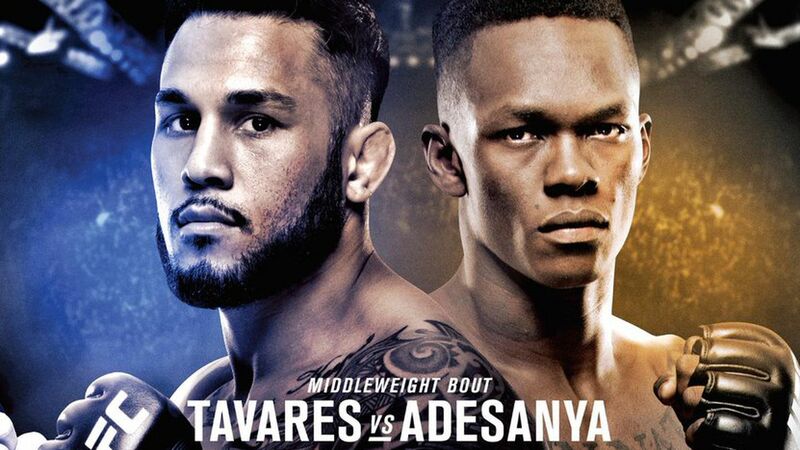 Adesanya is going to strike him at will and in the Championship rounds he’s going to eventually finish Tavares via TKO. 155 lbs. : Joe Giannetti vs. Mike Trizano (TUF 27 lightweight tournament final) – I didn’t watch a single episode of TUF, so forgive me. I’ll go with Giannetti via submission. 145 lbs. : Brad Katona vs. Jay Cucciniello (TUF 27 featherweight tournament final) – Again, I didn’t watch a single episode of TUF, so forgive me. I’ll go with Katona though via decision. 145 lbs. : Alex Caceres vs. Martin Bravo – Caceres often fights down to his competition, but with his UFC job potentially on the line, I expect him to get back on track with a decision victory. 125 lbs. : Roxanne Modafferi vs. Barb Honchak – Honestly, Honchak has better striking technique, but she lacks volume. Modafferi is the opposite, she’s not very technical, but she throws in volume. In what should be a close fight, I’ll go with Honchak getting the nod due to her cleaner shots that will show on Modafferi’s face. 185 lbs. : Alessio Di Chirico vs. Julian Marquez – Marquez has legit power in hands and I don’t think Di Chirico can hang with him on the feet as is. So with that, I have Marquez via knockout. 125 lbs. : Montana De La Rosa vs. Rachael Ostovich – Both fighters will be going for the submission, but it’s the wrestling of Ostovich that I believe will give her the best opportunity to finish this fight. So with that, I got Ostovich via submission. 155 lbs. : Luis Pena vs. Richie Smullen – I hear great this about Pena, so with that I have him via TKO. 145 lbs. : Matt Bessette vs. Steven Peterson – Peterson is tough as nails and constantly comes forward, but at the same time he’s extremely hittable. Bessette is an experience offensive fighter and I fully expect him to dictate where this fight goes. So with that, I have Bessette winning via decision. 185 lbs. : Gerald Meerschaert vs. Oskar Piechota – This is a fun fight to open the card, as we have two solid Middleweight clashing. Meerschaert will like to get this fight to ground, where he features a solid submission game. Piechota, while he’s shown a well rounded game, will like to keep this on the feet. He’s not the most volume based striker, but he’s accurate and packs a punch. As for my prediction, I’m going with Meerschaert. He’s tough, durable, has more experience and locks up submission very quickly. So with that, I have Meerschaert via submission.